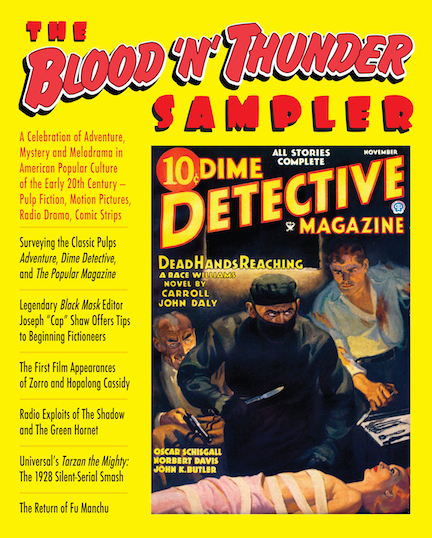 Murania Press » THE BLOOD ‘N’ THUNDER SAMPLER: Now Available! It’s primarily for such people that I’ve just put together The Blood ‘n’ Thunder Sampler, which reprints material from issues 24 through 29 as it originally appeared in the magazine’s pages. I could have produced a third volume of The Best of Blood ‘n’ Thunder, but the first two don’t accurately represent BnT in that they are smaller in size, with reset type and only a tiny sampling of the illustrations that grace each number. Quite frankly, I’m trying to appeal to potential subscribers and believe I’ll have better luck with a compilation replicating the actual pages of popular articles from the recent past. I’ve deliberately chosen for the Sampler a number of articles whose subjects are such readily familiar characters as Zorro, Tarzan, The Shadow, Hopalong Cassidy, and The Green Hornet. Those pieces — some of BnT’s best, in my opinion — should prove attractive to readers who might be less enthusiastic about, say, my 22,000-word survey of The Popular Magazine, which is also reprinted in the Sampler. And I’m betting some folks who purchase issues sporadically will be delighted to buy for $19.95 (postage included) a jumbo-sized BnT containing the best material from six back issues that cost $11.95 each. If you’re among those who’ve thought about trying BnT for a long time without ever “pulling the trigger,” take a chance on the Sampler and see what you’ve been missing. I’m pretty sure you’ll be pleasantly surprised.